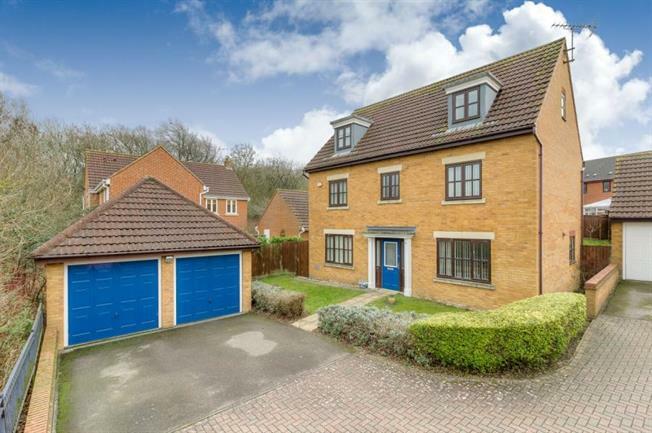 5 Bedroom House For Sale in Milton Keynes for Guide Price £535,000. Located at the bottom of a quiet cul-de-sac of just four houses; and with fantastic views of the Medbourne Park and Pavilion, is this fantastic five bedroom detached family home. On entering the property you are greeted to a bright entrance hall with tiled floor and doors leading to all ground floor rooms. The lounge with dual aspect, has French doors leading to the garden. The dining room is perfect for those family meals but large enough to be used as a snug or playroom. The kitchen with bay window is a fantastic bright room benefitting from a series of high and low level storage, integrated fridge/freezer and dishwasher plus range oven. The adjoining utility area has a second sink and space for a washing machine and tumble dryer. Downstairs is completed with a cloakroom. On the first floor are three bedrooms and a family bathroom. The master bedroom with fantastic views has two double built in wardrobes and an en-suite with both bath and shower. Bedroom two also benefits from an en-suite shower room. The second floor has two great size double bedrooms with a bathroom servicing either room. The current owners have installed a light tube giving this floor an abundance of natural light. The property also benefits from a garden to the front and rear, detached double garage with off road parking for several vehicles and is situated close to great schools and local amenities. This tranquil property makes for the perfect family home. The property in brief comprises: Entrance Hall, Cloakroom, Lounge, Dining Room, Kitchen Breakfast, Utility, Master Bedroom with En-Suite Bathroom, Bedroom Two with En-Suite Shower Room, Three Further Bedrooms, Two Bathrooms and Detached Double Garage.